This Air Fryer Chicken recipe has had rave reviews from readers for years upon years now- and for good reason! 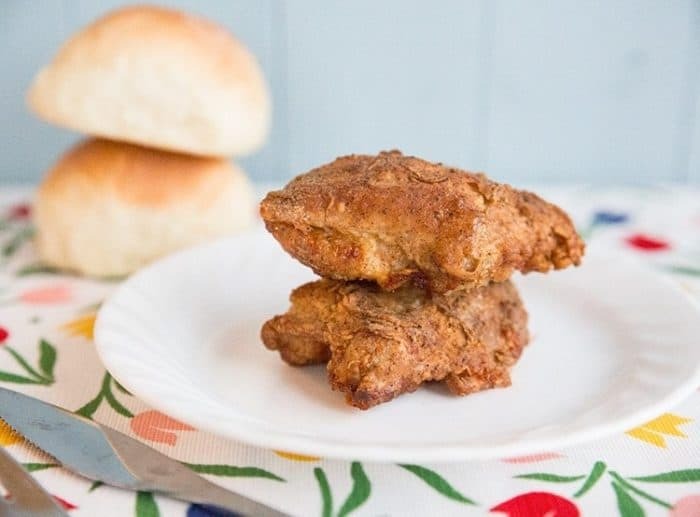 This fried chicken uses no oil and has a crispy, delicious skin over tender chicken meat that your whole family will love! This recipe has a coating on the chicken that makes the skin crispy and perfect! I am trying out the Phillips Airfryer, an appliance that has been on my to-try list for as long as I can remember. The main point to an Airfryer is that that you can create healthy, homemade meals in mere minutes – with less fat. As someone that has avoided a deep fryer all of her years – yes, even for my doughnuts chapter in my cookbook I used a large,deep frying pan- I really wanted to try an Airfryer out. 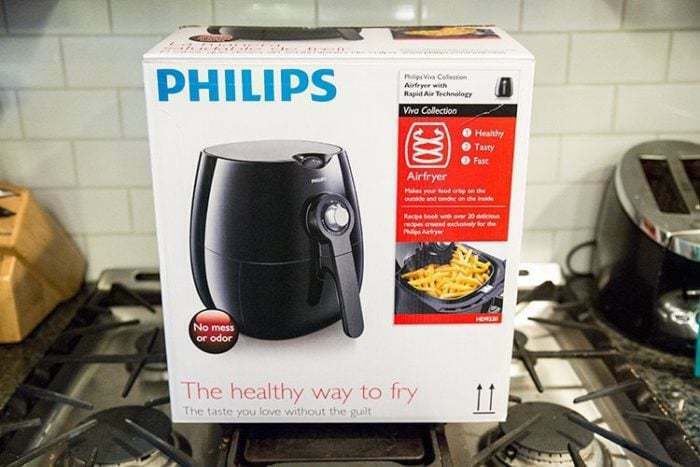 The secret to the healthy frying is that the Phillips Airfryer uses their proprietary Rapid Air Technology. Thanks to this technology, the airfryer fries, bakes, roasts and grills with little to no oil, making it a perfect solution for fast, tasty and healthy meals and snacks. Cooking chicken breasts in the air fryer is just as easy as cooking any other pieces, except that chicken breast can dry out faster. It’s better to use a batter like my recipe to seal in the moisture. If you use skin off you can be prepared for dryer chicken, so if you don’t want to eat the skin simply cook the chicken breast with the skin on and then remove it before eating. Cook the chicken breast in the Air Fryer for 25 minutes depending on how thick the chicken breasts are. If you have large ones they will take longer. Chicken breast should be cooked until 165 °F. How Long Do I Cook Chicken in the Air Fryer? These chicken thighs were done in 25 minutes, but it depends on the thickness of the meat, if you are using skin on or skin off and what cut of chicken you are using. Chicken thighs – cook chicken thighs in the Air Fryer for 25-28 minutes until they reach a temperature of 180-185°F. While you can cook them to 165 °F for safety sake, it’s a widely accepted knowledge among professional cooks that cooking chicken thighs to a higher temperature breaks down the meat fibers more and you end up with more tender chicken thighs. Chicken breasts– cook chicken breast in the Air Fryer for 25 minutes depending on how thick the chicken breasts are. If you have large ones they will take longer. Chicken breast should be cooked until 165 °F. 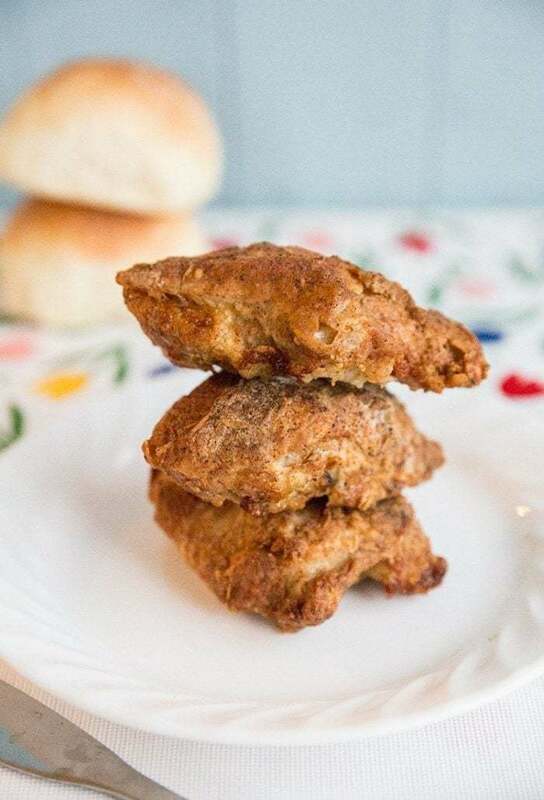 Can I Stack Chicken in an Air Fryer? The Air fryer cooks your food by circulating hot air around it evenly, so that means that for the cooking to happen properly all the surface of your food needs to be exposed to the hot air. I made three chicken thighs in the Phillips Airfryer and they were perfectly crispy . Look at how crispy that skin came out! My son devoured these – as 12 year olds are wont to do – and asked for more! So while I would only place 4 small chicken thighs in the airfryer, this would also work with chicken wings! The airfryer can only handle a certain capacity – see the manual- so it makes only a small meal, say for two people. You can stack the chicken on it’s side if you want, just make sure that there is lots of surface area to cook. The Phillips Airfryer comes with a fabulous recipe booklet that has 25 delicious recipes. Better yet, the Philips Airfryer app can be downloaded for free and has over 200 recipes; available in multiple languages and platforms so that you can get cooking! Make sure to check out my post on How to Make Bacon in Your Airfryer, it’s another good one! What I really loved about this chicken is that I used no grease at all. Nada. I put the chicken in there and it cooked up beautifully without a drop of grease added. The container itself is SO easy to clean. As you can see, you can fit another chicken thigh or random piece of chicken in there, but you want to make sure that you follow the instructions as to the amount of meat that you can place in there. You simply place the food into this little basket and away you go! It’s so easy! 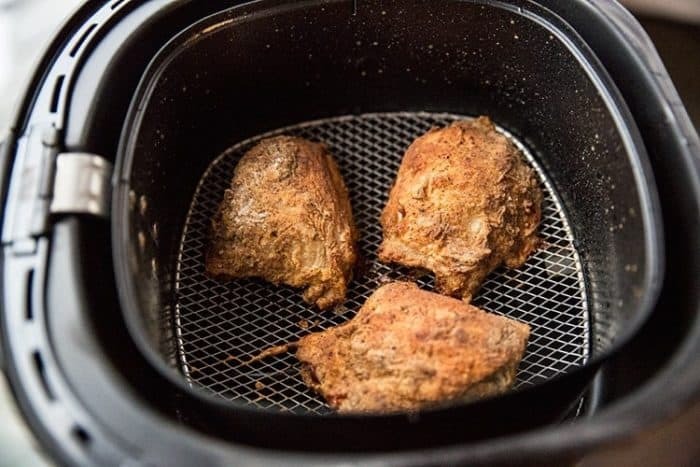 Some readers put a small bit of water in the bottom of their Air Fryer to prevent smoking, you can try this at your own risk! Apparently putting a little water in the container under the basket can keep the grease from the food from causing smoke. If you are getting a floury skin, then definitely use the cooking spray on the chicken. That means that the flour isn’t absorbing into your egg layer and that you didn’t have enough moisture. Butter Roasted Chicken – The Only Roast Chicken Recipe You’ll Ever Need Again. This recipes uses one of my very favourite seasonings in the world : Old Bay Seasoning. It’s a very East Coast spice mix ( I was SO happy to have it in New Jersey when we visited) but this Alberta girl has been using it for years already. Mike and I will simply sprinkle Old Bay onto our chicken drumsticks and roast them thusly, with nothing else on it. You could easily do the same with the chicken drumsticks in the Phillips Airfryer as well, if you want a gluten-free option! So, who has an airfryer and what do you think about it? Who has been wanting to try an Airfyer like I have? Stay tuned for two more posts where I delve into this appliance and really try it out! This post has been sponsored by Phillips, but all opinions remain my own. 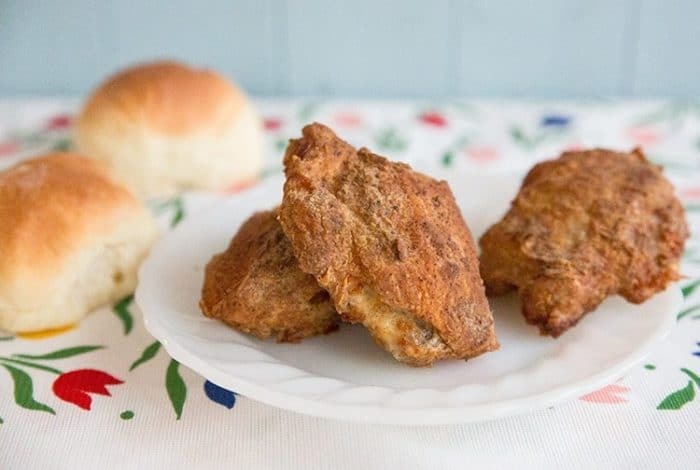 Delicious "fried" chicken done in an AirFryer! 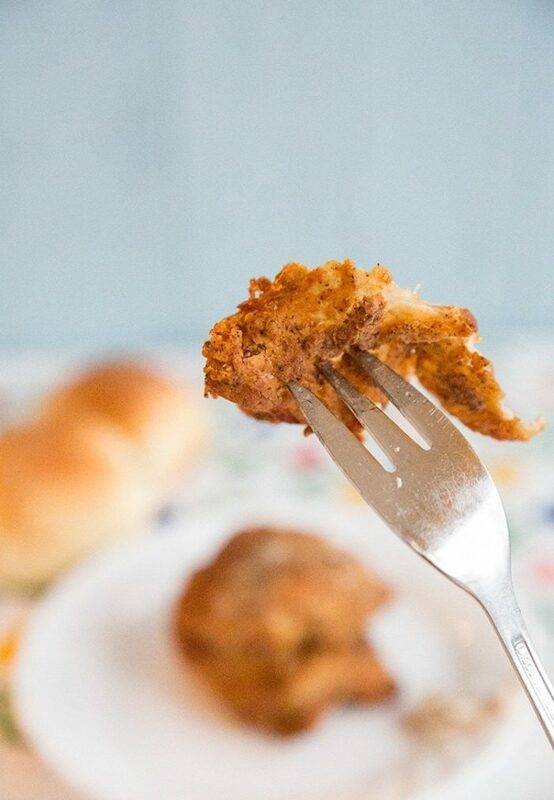 This air fryer chicken is the best recipe out there! Dredge the chicken through the flour mixture, then into the egg, then back into the flour mixture again. Shake off excess flour very well. If you want to, you can spray the chicken with cooking spray lightly at this point, but I don't bother. Old bay is what makes this so good! The chicken skin was crispy and the meat moist. My wife won’t each drumstick except she wanted more! Thanks, great suggestions above on how to add spice to the recipe. Used my air fryer because my kids wanted “fried chicken”. They LOVED this recipe and SO easy. This is definitely going into rotation. Thanks! Can they be cooked without anything on them except the spray? I would at least put pepper on the chicken…and like wings you could put cornstarch in a bag, add chicken . Spray with olive or canola oil. The chicken turned out amazing!!! It was moist and crispy and so easy to prepare! My husband loved it! How do you use the probe?? I need to use the cooking spray? Spray is optional. I usually use it though with vegies. For things like steak fries, Brussels sprouts, and onion rings, I mix my seasoning in a small amount of olive oil and then hand toss the food in a large bowl, then in the breading. For breaded pork cutlets I use an egg wash, flour, and bread crumbs then let the air fryer brown them as is. Try it until you find what works for you. Oil won’t brown the food; that comes from the food caramelizing. Thank you for posting this recipe. I just purchased an Airfryer a couple weeks ago. I don’t have many recipes and am just learning. My chicken turned out tasty and moist. So this was literally the best air fryer recipe for this southern girl because it’s was fried chicken in the air fryer! Mine was so good, thank you thank you 🙏🏻 Make sure to give it a spray if it’s very floury and it turns out amazing. This is a great recipe. All I had the first time we’re skinless thighs. They worked out perfect! No need for skin but I am sure it’s great with skin on thighs. At the end of cooking (last 6 min )if chicken lookes like flour, spray no stick cooking spray to dampened the flour and continue cooking. This was my first time ever making fried chicken in the air fryer. I was using large chicken thighs, so I was only able to fit 2 in the air fryer. So mine took about 30 minutes to cook completely. I was pleasantly surprised with how the skin came out. It tasted like extra crispy fried chicken. And the meat itself was still very juicy. However, I do think that while the skin was very tasty, the flavor didn’t really penetrate into the meat very well. So the meat itself was a little bland. I think if I were to make this again, I would brine the chicken or at the very least put some sort of dry rub on it and let it sit overnight to get a little extra flavor into the meat itself. I’ve had my air fryer for about a year and love love love mine. Steaks are great in the fryer, just season and put in fryer and turn half way through. They are great and moist too. Just be sure you put a little water in the bottom of fryer. This will cut out smoke and help keep them moist. I would buy another one if mine tore up tomorrow. Just received a Gourmia air fryer. Instructions and recipes don’t say when to use the crisper. Does all food just go into the basket, or should I always use the crisper? I received a Gourmia for Christmas. I have done chicken wings, coconut shrimp and preparing Chicken thighs now. I just put them inside, have not used any of the accessories. How did you get your nutrition factors? This is air fried and yet has more fat and calories than a Popeyes chicken thigh. The calculator takes ALL the flour and ingredients instead of just a dusting. It’s an estimate based on the calculator. Did you stay the chicken with out after you dredred it through the flour mixture? I did chicken thighs skin on and they were great, thank you. I find that I don’t have to place chicken pieces in a single layer in my Philips Air fryer. I just tumble the chicken in and rearrange it so there are some gaps around the pieces. The heated circulating air gets right around all the pieces. If you do it this way you might have to shake the basket a couple of times during cooking in order to shift the pieces around a bit. I’ve found with uneven pieces like whole wings I don’t even need to shake the basket because the irregular shapes of the wings create their own gaps. My strong recommendation is to always turn the food at least once. If you look inside the top of the fryer, there is an element. This cooks partially by heat AND by infra red radiation, similar to a broiler. Tossing and turning allows the food to get the caramelization to be more even. So while the heat may have cooked all the food, it may not have that crunchiness and flavor that the caramelization gives. When I do my fries, I will toss then with a spatula three or four times to help each fry get browned on each side. It also helps me judge how well they are cooking. So did you use ANY oil AT ALL? I can’t imagine it getting crispy w/ANY oil!! Pls advise & thank you! Yes, be sure and take the bone out of the boneless chicken. Thank you! Made this with boneless skinless thighs, just reduced the time and added some cooking spray! Love the spice!! OMG! This is the BEST fried chicken I’ve ever had. You have the best recipie for this ever! It was so juicy and crispy. It was a HIT with my family. This will be my go to from now on. Thanks so much for sharing. I Now Have A Aire Fryer, I’ m So Ready To Use it But it Did not Come With Any Recipe Book. Now I Can Follow You. Just finished trying your recipe (exactly as stated) in my brand new air fryer. Perfect!!! Thanks for the recipe! Hope everything I try in here turns out this good!